I was recently given the opportunity to review Sarah Jessica Parker's latest movie I Don't Know How She Does It which is out on DVD January 3. When I watched the trailer my first thought was this would be a great movie to watch with my momstown friends. Moms are bound to resonate with one of the characters in the movie. The moment the movie started, I was laughing. It begins immediately with the 'list'. I don't know a mom that doesn't do this! Fearing the teacher when you're late dropping off your child at a school! Getting snubbed by your daughter when you are not around much! Let's not forget the 'hair cut'! It was all too familiar with a recent business trip to Toronto for our momstown Conference. Except for me I missed the first time my son stood on his own. I could go on and on but I don't want to spoil the movie. 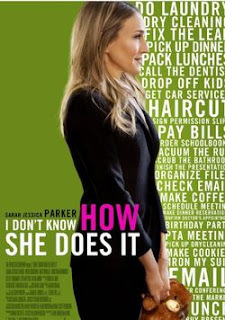 Based on the bestseller by Allison Pearson, I Don't Know How She Does It is about Kate Reddy (Parker), who is a working mom in Boston that is trying to juggle marriage, two children and a high-stress job. The movie finds humour in the stereotypes that stay-at-home-moms and working moms go through. From Allison, Kate's working mother friend, to the scary supermoms at her daughter's school to her workaholic, child-phobic young junior associate Momo, you'll find yourself relating far too often to the characters. We all struggle to be that supermom, perfect wife and exceptional employee. Mama guilt is far to common, as is the comparison to the other mom's around you. How does she do it? Look composed, clean, calm, thin, well rested? I've heard it often myself. Ester, I don't know how you do it? I won't lie and say it isn't stressful. We make it look like we have it all together yet in reality we are barely making it through the day. I lay awake at night making my 'list'. I type emails while feeding my son his breakfast. I bought my tarts this Christmas instead of making it from scratch. The trick is to put it in a box with a nice ribbon and it looks like I've been up all night baking. I haven't experienced lice yet, but I sometimes forget the last time I've showered! It took me three times to get through this movie. Not because it was awful, but because I kept getting interrupted from a waking baby. I found irony in this. The first night I attempted to watch it I was wrapping Christmas presents while watching the movie, running to rock a crying baby back to sleep and then continuing on with my work. Then I had to finish setting up toys from Santa so my kids could have a perfect Christmas morning. I finished the night at 2 am, preparing our traditional Wife Saver for Christmas morning brunch. The movie couldn't have come at a better time for me. This past year has been the most hectic, exhausting yet rewarding year of my life. While I struggle to find balance as a mom, wife and business owner I love my children, love my husband and love my job. Want to make life a little easier. You can enter to win a $1,000 Gift Certificate to Molly Maid at Saveland.ca. Enter here.